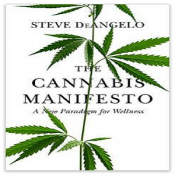 A new book out from Steven DeAngelo ( The owner of the largest dispensary in the US, as well as long time cannabis activist) hit the shelves this week, and wow. It is a huge development. This book comes right at the right time. As the nation begins to unravel all of the lies which have been told about cannabis over the years, Deangelo’s writing style cuts through the nonsense and gives us a clear look at the past as well as a glimpse into the future. Covering a variety of subjects, the chapters of the books are as diverse as the cannabis plant itself. The Cannabis Manifesto sticks to a framework of 8 easy to remember points about marijauna. 1. Cannabis is not harmful, but prohibition is. 2. Cannabis should have never been made illegal. 3. Cannabis has always been a medicine. 5. Cannabis reform doesn’t harm communities, it strengthens them. 6. Cannabis should be taxed and regulated as a wellness product. 7. Cannabis reform is a social justice movement. 8. Legalization cannot and will not be stopped. As someone who has become kind of tired by a lot of the Cannabis Culture movement, and has bemoaned the quality of much of the writing which makes it into print. The Cannabis Manifesto is a breath of fresh air. It reminds us that there was a concerted and misguided effort to demonize the herb, and the time has now come to look behind the screen and see who’s really running the show. You can get a copy HERE! Next Is Smoking Resin Bad For You?